UPDATE 9/6/14: Tests have been updated again. Go here to see the latest. UPDATE 3/9/14: Found the most recent updated list, revised November 15, 2013, of all standardized tests for Alabama’s children. Here’s a link to the PDF and the image is displayed below. Two new sets of tests are being implemented in our K-12 Alabama public schools: the QualityCore End-of-Course tests for high schoolers (this year) and the ACT Aspire series for our third through eighth graders (beginning next year). Our Alabama high schoolers in 9th and 10th grade are nearing time to take their first End-of-Course (EOC) tests under the new assessment plan approved by the State Board of Education through Plan 2020. The EOC tests replace the Alabama High School Graduation Exam (AHSGE) for 9th and 10th graders. This year’s 11th and 12th graders will continue to take the AHSGE. Next year’s 12th graders will be the very last group to take the AHSGE. 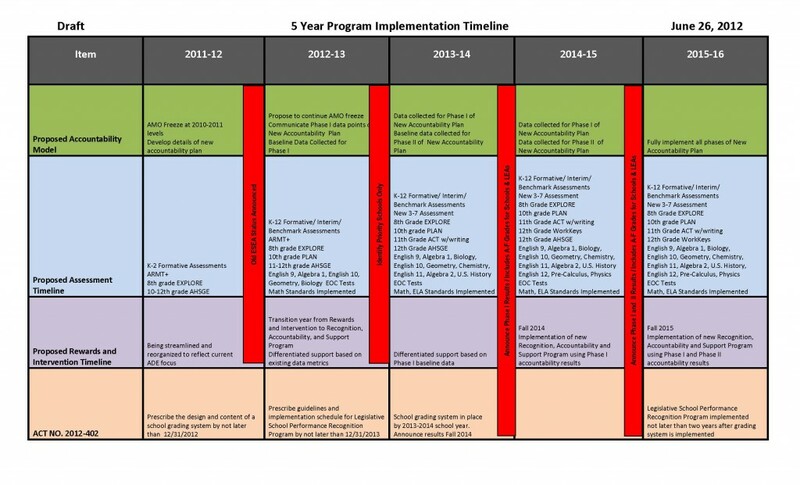 Here’s the big, long timetable showing which assessments (edu-speak for “tests”) will be taken when and how the tests fit into the big accountability picture. This is the taken from the ESEA flexibility request submitted to the U.S. Department of Education last September. There has been one change to this document: the “New 3-7 Assessment” to replace the Alabama Reading and Mathematics Test (ARMT) will be the Aspire series of tests developed by the ACT folks and it will be implemented for grades 3-8. Also, it appears the mention of the 2014-2015 administration of the AHSGE to Grade 12 is inaccurate based on this October 2012 presentation by State Superintendent Dr. Tommy Bice. UPDATE: July 15 – All EOC tests except for English 10 and Algebra I have been dropped for the 2013-2014 school year. 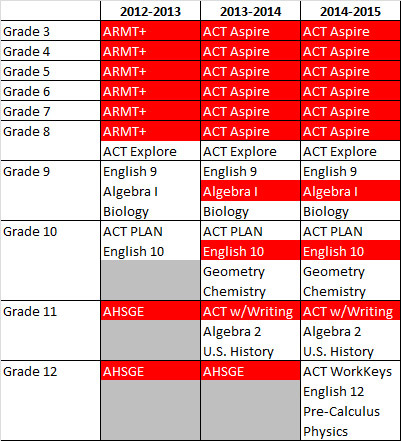 The red-filled cells indicate which tests will be used for accountability purposes, which means which test results will be used to “grade” our schools with the new grading system. This is always subject to change, but this is how it stands right now. Note that while I list Geometry and Chemistry as “Grade 10 EOC tests”, a student doesn’t have to be in a particular grade to take that subject, and the EOC test will be administered at the end of the course regardless of in which grade the student is enrolled. I simply tried to make the table easy to understand and placed the subject in the grade most likely in which the student may take that subject. 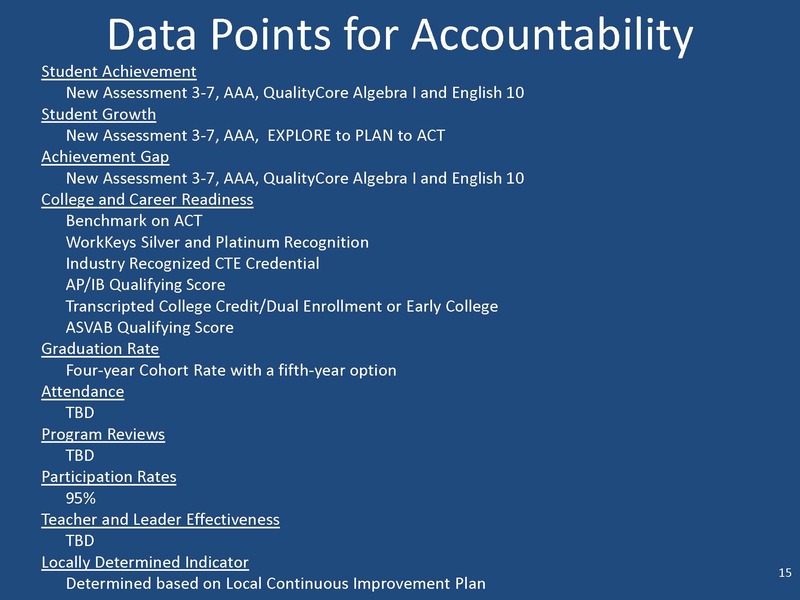 Here is a slide from Bice’s presentation to the School Superintendents of Alabama last fall that specifies which pieces of which assessments plus which additional indicators will be part of the full accountability package that is due to replace Adequate Yearly Progress (AYP)….if the U.S. Department of Education approves the ESEA Flexibility Waiver request submitted last September. 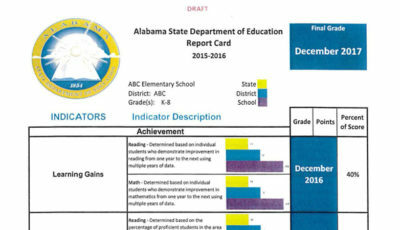 The “AAA” is the Alabama Alternate Assessment used to test children with severe cognitive disabilities. 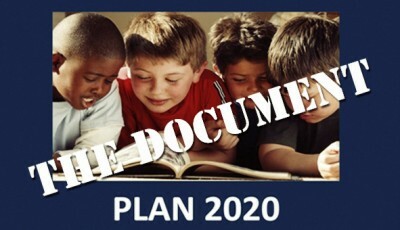 Click here to view a memo Bice sent to superintendents clarifying the timing and procedure for implementation of the new assessments this year. The details of all of this are still a bit fuzzy. Much will depend on what the feds say in response to the waiver request. UPDATE: Just found this FAQ document on EOC tests, dated March 7. Lots of good stuff in it. Remember, only five four EOC tests are being given this year: English 9, English 10, Algebra I, Geometry, and Biology. More will be added in subsequent years (see chart above). UPDATE: July 15 – All EOC tests except for English 10 and Algebra I have been dropped for the 2013-2014 school year. Back in 2009, the Alabama State Board of Education voted to replace the AHSGE with end-of-course (EOC) tests. At that point, no one was certain what would replace the AHSGE, just that it would be replaced. 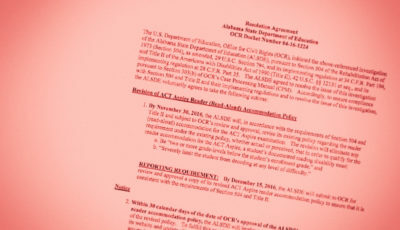 The ALSDE sent districts a notice that EOC tests would not be a part of a student’s grade for the 2012-2013 school year, but parents should expect the EOC test to be a part of the student’s grade in the future. Each district will have the option of determining what percentage of a child’s grade the EOC becomes. Think of it as a replacement for final exams. The ALSDE chose to utilize the ACT QualityCore EOC test series, which advertises itself to be aligned to the Common Core State Standards (CCSS). One could wonder whether the QualityCore is aligned to the remainder of Alabama’s College and Career Ready Standards (CCRS), though. That concern has not yet been explored, at least not publicly. Please note that if your child has an Individualized Education Program (IEP) or Section 504 Plan in place, you should have received some type of notification about whether or not your child will be participating in the EOC testing. While the ALSDE prescribes which dates on which tests will be given, each school district has been given the option of giving the EOC tests anytime within four weeks of the end of the semester. Schools that operate on block schedules were given the option of giving EOC tests after the first semester of school was completed this year. I have not heard any feedback from any students or parents or teachers who have had a first-hand encounter with the EOC tests. Please share if you have any feedback. 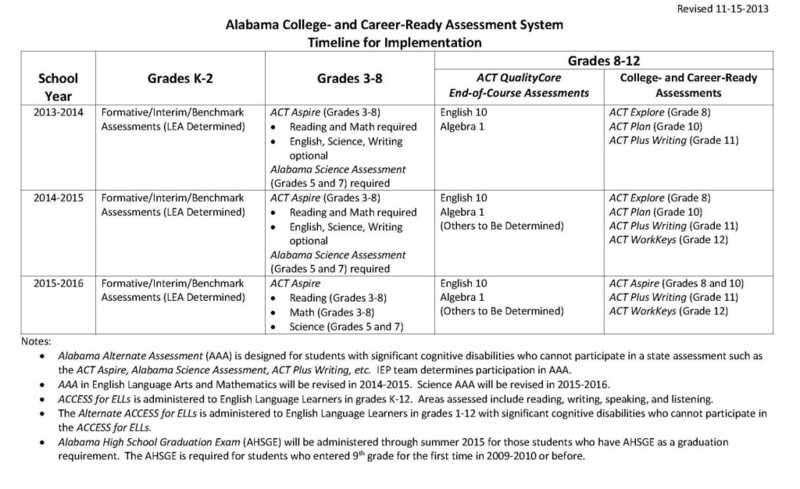 The ACT Aspire will replace the ARMT beginning next school year (Spring 2014 testing). The ACT Aspire is a relative unknown, with Alabama being the first state to adopt the Aspire series to assess student learning in grades 3 through 8 statewide. Here are some notes on the discussion that transpired surrounding the State Board of Education’s adoption of the Aspire assessments. It should be noted that the ARMT will continue to be used to assess student learning in science for the next couple of years. Here is the press release the ALSDE issued to announce the board’s adoption of Aspire. Aspire is fully aligned with the CCSS, but again, one has to wonder how well it matches up to Alabama’s CCRS. I suppose we will find out. I can’t help but feel a bit of deja vu, remembering the reasons/excuses I was given when asked why my children’s school’s student body performed so poorly on the Stanford Achievement Test (SAT, but not the SAT college entrance exam) 10 years ago. 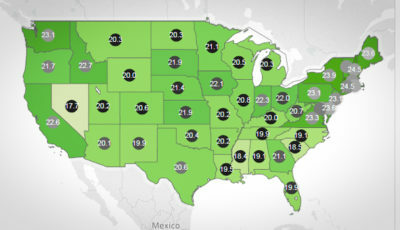 I was told that the Alabama Course of Study (COS) didn’t align very well with the SAT and that’s why our students didn’t perform well, which is what ultimately led to the development of the ARMT. Let’s hope we learned our lessons and are not repeating the same mistake by choosing a test that doesn’t cover what our teachers are teaching. One thing we know for certain: teachers will teach that on which students will be tested. Especially if those test scores are somehow factored into reports on their individual success as teachers. Here’s hoping he’s right. More on this subject as it is released. Thoughtful ideas , I Appreciate the info . Does anyone know if my assistant might obtain a sample a form example to edit ?